This ancient village of Hedgeley in Northumberland is the origin source of this habitational name. 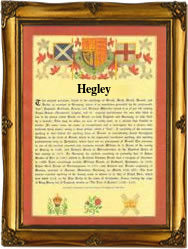 The spellings are recorded as Hedgeley and Hegley, the latter being apparently a variant form from Yorkshire. The village is first recorded in the Annals of the Percy's, the titular Lords of Northumberland in 1150 A.D. as "Hiddeslie" and later in 1335 as "Higgeley". The translation being "the hay farm" (heag-leah), from the old English pre 7th Century. Examples of the surname recording include Dorothie Hedgley who married Humphrie Thorneycrafte at the church of St. Botolph's, Bishopgate, London, Thomas Hegley who married Margery Nelson at kirby Wiske, Yorkshire on June 11th 1704 and Sarah Heggley who married one Robert Cater, at Tottenham, London on September 12th 1784 in the reign of George 111, (1760 - 1820). The first recorded spelling of the family name is shown to be that of Robert Hegley, which was dated February 19th 1600, a christening witness at Barnborough church, Yorkshire, during the reign of Queen Elizabeth 1, known as "Good Queen Bess", 1558 - 1603. Surnames became necessary when governments introduced personal taxation. In England this was known as Poll Tax. Throughout the centuries, surnames in every country have continued to "develop" often leading to astonishing variants of the original spelling.